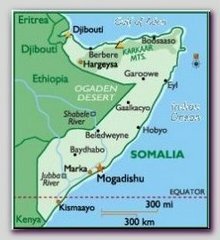 SomaliA, in East Africa, once an Italian colony, stretches on 638,000 km and has a population of about 12 million (estimation 2006). SomaliA is an independent country since 1960.Almost all the population is Muslim Sunnites. SomaliA is still a tribal society where loyalty to the tribe comes before anything else. In 1977 Somali Army invaded Ogaden desert in Ethiopia, inhabited with Muslim tribes from Somali descent, but suffered in 1978 a humiliating defeat. Since then SomaliA crumbled to several tribal territories controlled by warlords that are fighting each other what ever the reason is. The disintegration of the country destroyed the economy and the country is one of the poorest in the world. All international attempts to send food failed when armed gangs and warlords plundered the shipments of food and medical aid. In 1992 USA led a military coalition to protect the international aid effort. That military foreign interference that endangered the interests of the local warlords arouse a very violent insurgency against the foreign invaders and USA with her allies left the country in 05/1993. Despite constant efforts to restore a central regime and administration SomaliA is, basically, an ungoverned Muslim country and a safe haven to Islamic militants. In the 90s’ an Islamic organization in SomaliA – “Itihad al Islamiya” (United Islam) operated as an extention of Al Qaeda and an operational base for Al Qaeda in East Africa. This organization provided the logistic infrastructure to the Nairobi 08/07/1998 attack. In 06/2006 the successors of “Itihad al Amaliya”, under the name “Council of Islamic Courts” (CIC), managed to take over two thirds of SomaliA including the Capital Mogadishu. In the beginning of December 2006 the Second Ethiopian-Somali War began. Ethiopian troops, probably encouraged by USA, invaded SomaliA to help the legal government, so to speak, to restore law and order. Within few days they entered Mogadishu and the southern town of Kisamaayo. Today, (06/2007), the situation in SomaliA is not much deferent than in Iraq or Afghanistan. Foreign Ethiopian troops, backed by USA, support a pro Western government while in the country a violent Islamic insurgency is carrying out all kinds of terror and suicide attacks. Even the residency of the Somali PM was a target to a car bomb driven by a suicide bomber and exploded in the entrance of the compound on 06/03/2007.